On sunny days, Mr Monkey relaxes in his back garden. He protects himself from the deadly radiation of the sun with his sun hat and shades. 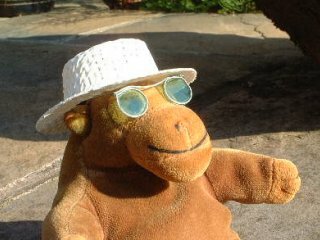 Mr Monkey's sun hat was purchased from a local craft store. His sunglasses are cunningly wrought from wire, with lenses of plastic from a soft drink bottle (flattened by the power of boiling water) with details from black foamboard.